The Horror Honeys: The Devil's Eyes & The Spirit of Halloween! The Devil's Eyes & The Spirit of Halloween! This October, the Honeys are going to share all of their favorite Halloween/October movie traditions with you. We will be stepping outside our genres to review the movies that have become seasonal staples in our household. And lucky me, October 1 landed on Revenge Wednesday! So I get to share with you my October first annual tradition: a double feature of John Carpenter's Halloween and Michael Dougherty's Trick 'r Treat! "It's Halloween; everyone's entitled to one good scare." I'm sure it's no mystery as to why Carpenter's Halloween has been my October 1 tradition since I was 16-years-old. I can't think of many better ways to ring in the best month of the year. John Carpenter didn't invent the (film) slasher genre: that designation probably belongs to Alfred Hitchcock's Psycho and could even be traced back as far as the silent movie era. What Halloween did was re-invent the movie slasher and bring it into the mainstream. Carpenter and his hardworking cast and crew proved that a group of people committed to making a quality indie horror film can do it on a shoestring budget. And what resulted was one of the best horror films of all time. I doubt I have to re-tell the story of Halloween for you kids, so I won't. If you're here, you've seen Halloween. And if you haven't, just go away. You're obviously not the person I thought you were. Anyway, as the Honeys discussed on our Michael, Freddy, Jason podcast recently, what I've always loved about the ORIGINAL Michael Myers is the lack of backstory. We don't get any sort of detailed reasoning for why Michael is a soulless murderer: he just is. No amount of therapy or hugs from mommy can repair his damaged psyche. He is just compelled to kill and can't be fixed. What is more terrifying than that? It helps that Carpenter filled his film with fabulous young actresses who seemed like girls anyone could have gone to high school with. 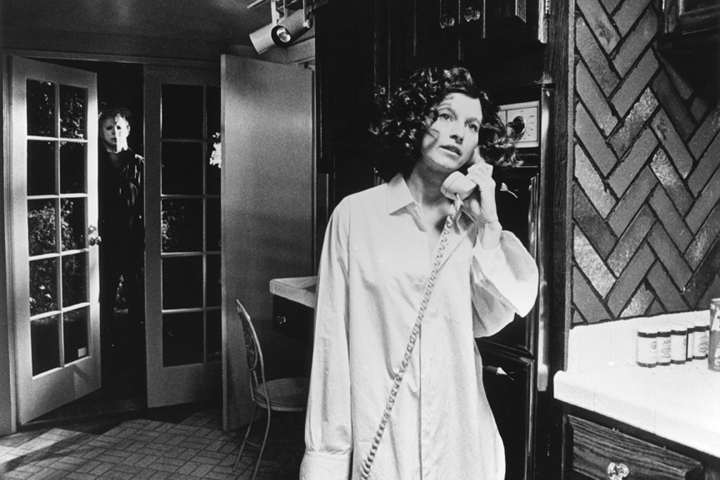 Jamie Lee Curtis at the very beginning of her career, PJ Soles, and Nancy Kyes as Annie, my personal favorite snarky beyotch... And of course, that iconic Carpenter-penned Halloween score, that more than one Honey uses as her ringtone all year round. Halloween is like October comfort food: delicious, filling, and familiar. No matter how many times I watch it, it always feels new, and that is what makes it perfect for a traditional October watch! Rhonda: Samhain, also known as All Hallows' Eve, also known as Halloween. Pre-dating Christianity, the Celtic holiday was celebrated on the one night between autumn and winter when the barrier between the living and the dead was thinnest, and often involved rituals that included human sacrifice. Rhonda: I like your eye patch. I didn't get a chance to see Trick 'r Treat for the first time until Halloween night of 2009 (I was stuck at home sick that year), but as I watched my Netflix-ed copy, I was online buying a copy for myself. Within minutes, Michael Dougherty's Halloween anthology was one of my new favorite films. It was cheeky, and gory, and so loaded with Halloween spirit that I knew it had to become my new October 1 tradition, along with Halloween. Starring genre favorites Anna Paquin, Brian Cox, Leslie Bibb, Dylan Baker, and Tahmoh Penikett, the horror anthology features stories that revolve around the spirit of Halloween, or lack there of. Each short film is tied together by the appearance of the pint-sized Samhain, or Sam... the literal manifestation of Halloween spirit. And if you aren't celebrating in a fashion that Sam deems worthy, he will make sure you never forget your mistake. Who HASN'T dreamt of taking a few people out this way? Anyone? No? Just us? Ok. 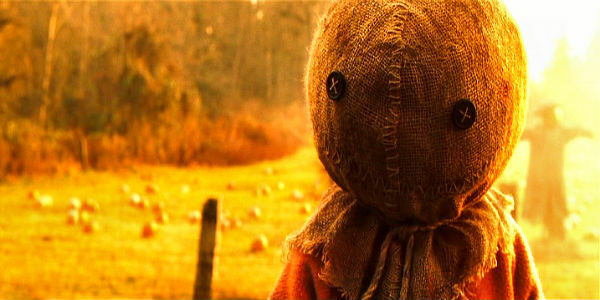 There is so much to love about Trick 'r Treat that I scarcely know where to begin. The classic comic book style, the way in which each story is perfectly tied to the next and the one that came before, the strangely endearing collection of werewolves and serial killers and ghostly murderous children... they all combine to make one of the best horror anthology films to come around in years. Not to mention, the absolutely adorable and iconic Sam! Who doesn't love that little face, whether inside the bag mask or out? Revenge Honey Ratings for Both Movies: 5 Candy Corns out of 5!